Heavy snow and “hazardous” freezing rain is set to smash into Britain on Saturday, with snow blizzards expected in the north of the central belt in Scotland. BBC Weather forecaster Nick Miller said: “After several days of quiet weather, the weather just in time for the weekend is certainly much more active – potentially very hazardous. Met Office amber warnings in force for ice and snow. In terms of ice, it is just about the worst kind. “Freezing rain affecting parts of the UK – particularly in the Midlands, northern England and Scotland and the result of that will be widespread ice and some very dangerous conditions. “We are bringing in an area of low pressure from the Atlantic into what as we know is plenty of cold air across the UK. The BBC forecaster warned Freezing rain could cause chaos on the roads. Explaining the rare weather occurrence, Mr Miller explained how freezing rain forms. He said: “Snow – cold enough just near the clouds for that to fall out of then. “But then in it will go into a warmer air area of the air above us. That then melts into rain. “But then once it meets a layer of cold air very close to the surface, which is what we will have on Saturday, we end up with that rain freezing in contact to the frozen surfaces. 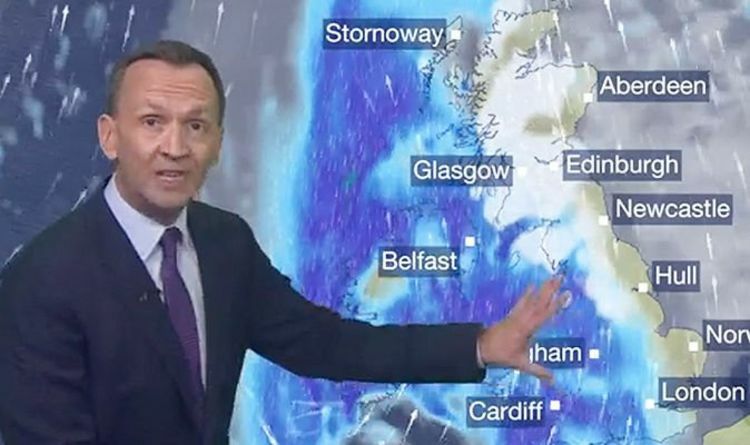 While snow is expected in the north of the country, the BBC Weather host warned that Northern Ireland, Wales, south-west England will suffer from “very wet and very windy” weather conditions on Saturday. He added: “That wet weather very slowly feeding north and east into that colder air – parts of the Midlands especially northern England and Scotland. That freezing rain, widespread ice threat, but also some sleet and snow in places, more especially over the higher ground. The snow and sleet will steadily sweep out of northern parts of England on Sunday but Scotland will still be stuck with a mixture of rain, sleet, snow and ice. While the rest of the country is “a bit quieter” on Sunday in some places. The Met Office has issued amber and yellow warnings from this morning, adding that parts of the country face "very dangerous travelling conditions". Overnight temperatures are said to drop to -8C (18F) on Saturday. Met Office meteorologist Steve Willington said: “This weekend's weather brings a range of winter hazards, with the possibility of heavy snow and blizzards in parts of Scotland and freezing rain for northern parts of the UK. “As such, there is the potential for disruption to travel on the roads and possible delays or cancellations to public transport services, so we encourage people to keep an eye on the latest weather forecast warnings and to take care when travelling. “At the moment, the heaviest snow is expected over higher ground in Scotland with the chance of drifting snow due to strong winds.